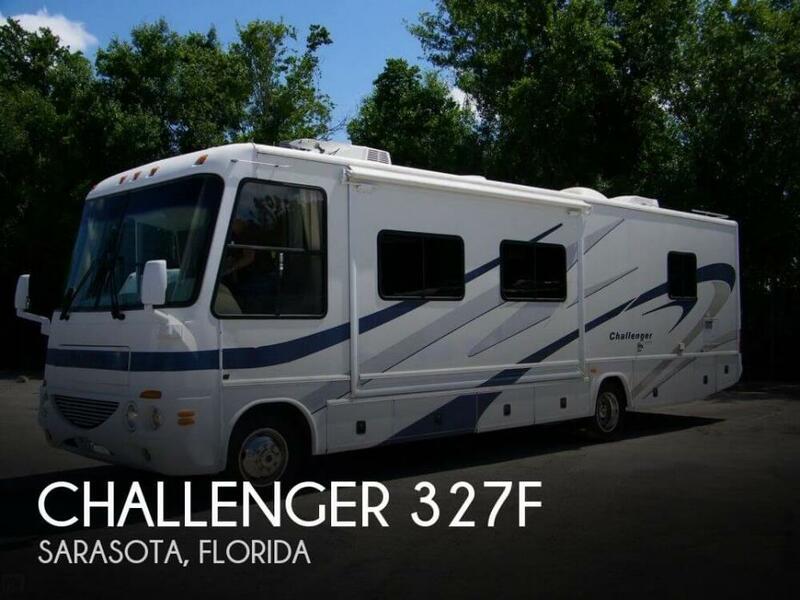 Fully equipped comfortable Class A 2004 37ft Damon Challenger Intruder 373W with a 8.1L V8 Vortec gas engine on a Workhorse chassis and Allison transmission. The engine has 65496 miles and runs great. Onan Marquis Gold 5500 generator with 347 hours, New front tires, Extra tire, Hydraulic leveling jacks, Ducted dual roof AC units with remote controls, Rear backup camera, Electric/Gas refrigerator with a new circuit board, Electric/Gas water heater with Aqua hydronic heating system, Convection oven/microwave, Three burner gas range, Two flat screens HD TVs, Split bath design, Corian countertops, Laminate/Carpet/Tile flooring, 16 ft awning, Three slides with awnings, Excellent roof with ladder, Outside shower. Plenty of basement storage with several pass-through compartments DVD players, VHS player, AM/FM radios with CD players Walk-Around queen bed with storage and tinted windows. Ample bedroom clothes storage and two chairs with ottomans Sofa couch and recliner New Components within the last two years include: Hydraulic leveler motor, Water heater element, All batteries, Supplemental manual shut-off battery switch, Bilstein shock absorbers, Front A/C, Radiator fan and fan clutch, Refreigerator control panel. Also included with sale: Macerator sewer pump, Viar air compressor, Blue Boy portable sewage tank. As per the owner, the coach is in very good condition inside & out. We're told all systems work as they should. Lightly used RV. The owner has all maintenance records. Just add gas, and you're ready to go! 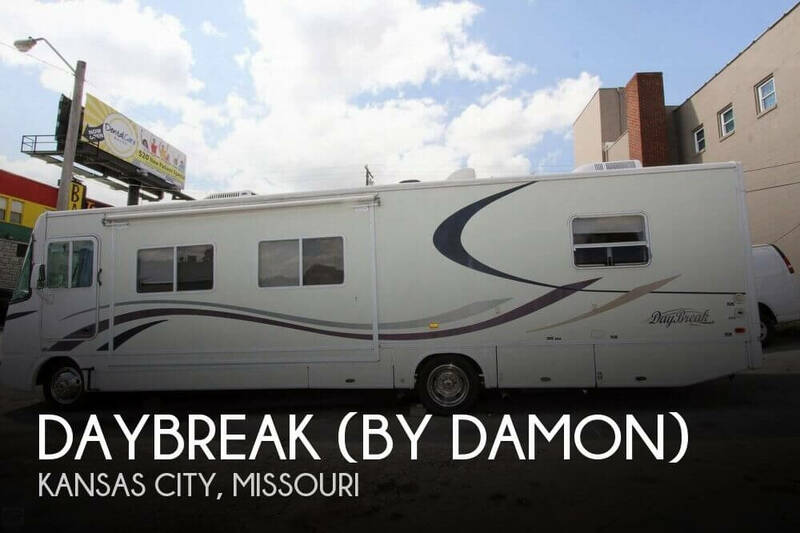 Stock #166745 2005 Damon Daybreak 3270 Class A Coach, low hrs, Onan Generator If you are in the market for a class a, look no further than this 2005 Damon Daybreak 3270, just reduced to $22,900. 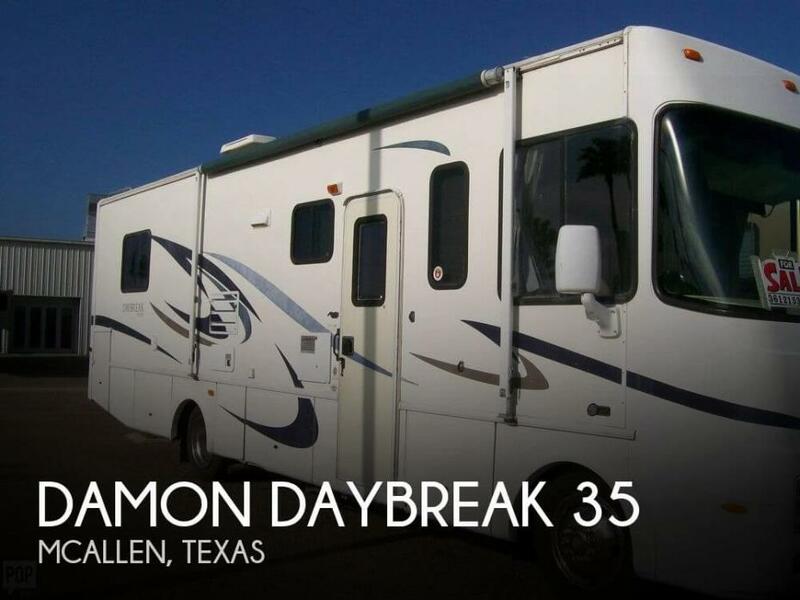 This Class A is located in McAllen, Texas and is in great condition. She is also equipped with a General Motors engine that has 18,600 miles. Reason for selling is has health issues. 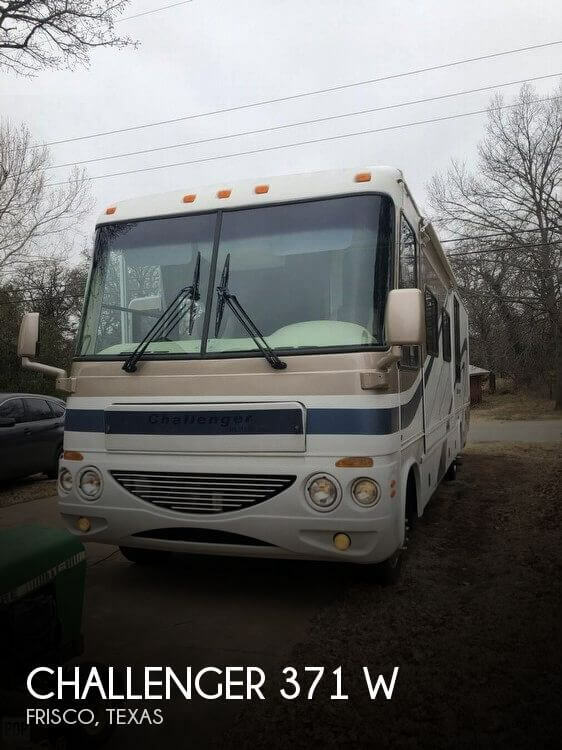 Per the seller Everything on the RV is in working order Seller reports the RV is be in great condition with only 17,000 miles The RV recently had a new awning installed Rear Camera 2 New TV's Recently Serviced Stock #171177 CREAM PUFF 2004 CHALLENGER BY DAMON FORD V 10 TRITON ONLY 16,000 MILES & 170 HOURS on GENERATOR ! If you are in the market for a class a, look no further than this 2004 Challenger 371 W, priced right at $23,750. This Class A is located in Edmond, Oklahoma and is in great condition. She is also equipped with a Ford engine that has 16,000 miles. Reason for selling is does not use. The Essence is in very nice condition and has been kept clean and maintained. There is some pitting where the Diamond plastic coating is on the front end. It went through an area of intense bug infestation. The damage is specific to the plastic coated area. The paint outside of there is fine. Owner believes the plastic was soft from heat and enabled the bugs to stick and cause the damage. The coded lock on the front door has not worked since the original owner bought RV new. There is an added Hughes RV Voltage Booster Extra 50 amp 25' Extension Cord. -New Fabric on Awnings (10-16) -Main Front Window Shade (10-16) -Refrigerator New Cooling Unit (1-16) -Six (6) Brand new Goodyear RV Tires (installed March 2016), - 4 Brand New House Batteries (installed February 2015) - 2 Chassis Batteries (replaced June 2016) -Replaced both Roof A/C's added Heat Pump Front (10-15) Rear not sure exact date. Both units work with original controls. -Surge Protector Replaced (2016) This is a beautiful coach. Bring all respectable offers. Stock #171066 2008 Damon Essence model '40B-Freightliner-425hp' in great condition. 40.6 feet in overall length. Sleeps 6 comfortably within as well. If you are in the market for a class a, look no further than this 2008 Essence 40B, just reduced to $95,000. 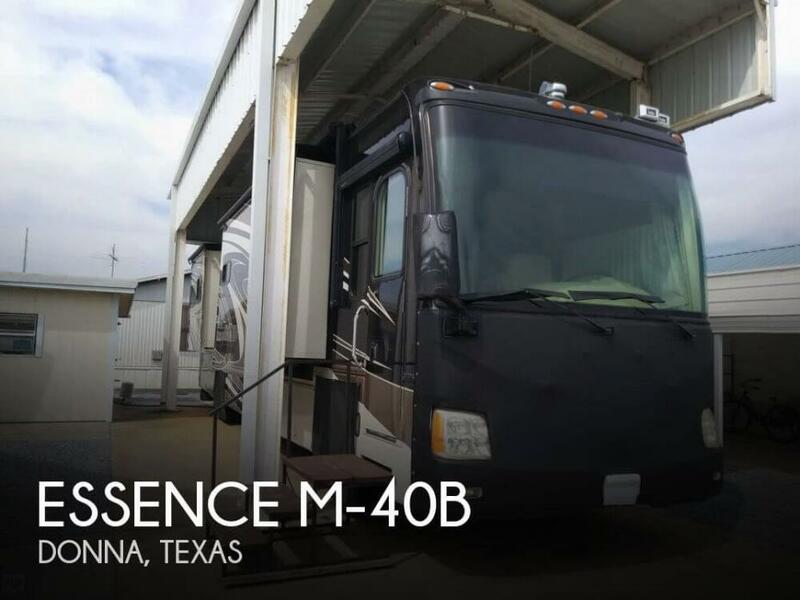 This Class A is located in Donna, Texas and is in great condition. She is also equipped with a Cummins engine that has 24,875 miles. Reason for selling is no longer time to enjoy. As you can see from the pictures this 2001 Daybreak (by Damon) 3270 is in good condition. As you can see from the photos there is a little damage on the rear right storage door. Per the seller, everything is in working order. Stock #159394 Enjoy the high road, the dirt road, any road, with a Thor. If you are in the market for a class a, look no further than this 2001 Daybreak (by Damon) 3270, priced right at $31,200. This Class A is located in Kansas City, Missouri and is in good condition. She is also equipped with a Chevrolet engine that has 47,000 miles. Extremely well maintained, clean, and perfect live-aboard for full timers. The Freightliner Chassis with the Cat Diesel is more than enough for even the toughest terrain. Three Roomy Slide-outs, very easy operation. Seller was very handy and kept it maintained, and repairs were handled immediately. Stock #099155 Beautiful coach with all the bells and whistles! Low mileage/ well kept, and lots of extras! 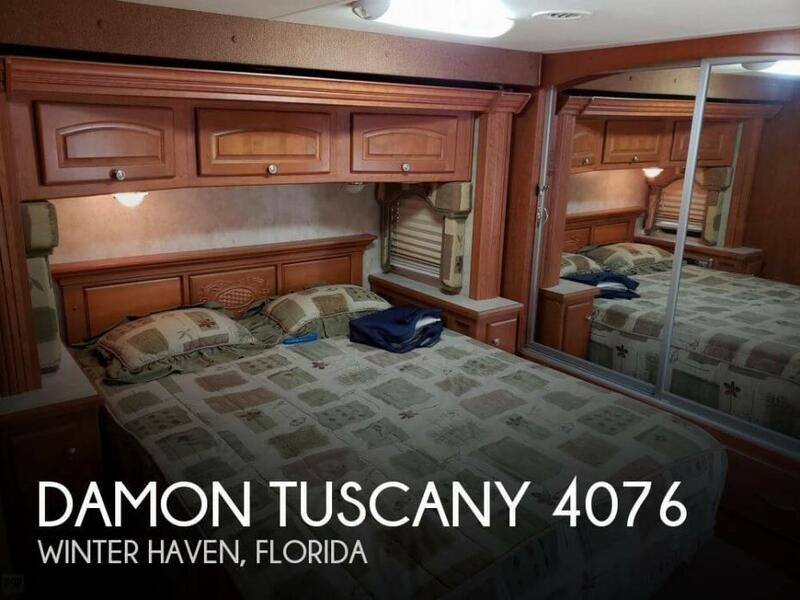 If you are in the market for a class a, look no further than this 2006 Damon Tuscany 4076, priced right at $88,900. This Class A is located in Winter Haven, Florida and is in great condition. She is also equipped with a Caterpillar engine that has 47,066 miles. 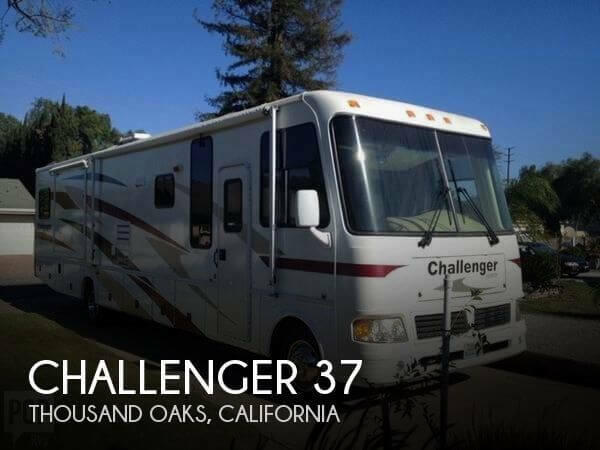 Reason for selling is after 12 years on the road full time, as clowns, seller does not use it anymore..
Stock #175687 For Sale by Owner 2006 37' Damon Challenger Class A Motorhome. Only 7,100 miles. With Ford Triton V10 Gas Engine, Used Very Little, Everything Works, If you are in the market for a class a, look no further than this 2006 Challenger 372, priced right at $38,900. This Class A is located in Thousand Oaks, California. She is also equipped with a Ford engine that has 7,030 miles. Reason for selling is no longer using. The overall condition of the RV is normal wear and tear. The upholstery is clean and in good condition. The headliner was in good condition with no signs of leakage. The carpet flooring was in good condition with some slight wear. The wood flooring was in good condition. Stock #168457 Low Miles, This CHALLENGER by DAMON is all you will need this season, get it while it lasts. Time to hit the road. If you are in the market for a class a, look no further than this 1999 Challenger 330, priced right at $24,250. This Class A is located in Sterling Heights, Michigan and is in good condition. She is also equipped with a Chevrolet engine that has 43,834 miles (as of January 27). Stock #176151 Excellent Damon Intruder 350 with remodeled interior! If you are in the market for a class a, look no further than this 2004 Intruder 36, priced right at $36,700. This Class A is located in Lapel, Indiana. She is also equipped with a Chevrolet engine that has 70,500 miles. This 2006 Intruder by Damon 373T is in good shape for the age of the unit. Both the exterior and interior is clean and well maintained. SERVICED BY A DEALER ONLY! 2017: NEW BACK UP CAMERA 2016: NEW TIRES - see the photos! VERY CLEAN - PET FREE - SMOKE-FREE NO BUMPS - DINGS OR MARRING ON THE EXTERIOR ODOR FREE - LEAK FREE - CLEAN READY FOR THE NEW OWNERS!!! One item need repair: Awning is starting to flake - per Seller YES IT STILL WORKS. The owners use it strictly for travel purposes. It is clean and free of any stains, marks, chips, abrasions. Pet free and odor free. Stock #174882 Has all the amenities of home! Huge bedroom with SleepNumber Queen ! Ducted A/C and Heat If you are in the market for a class a, look no further than this 2006 Intruder 373T, priced right at $61,200. This Class A is located in Franklinville, New Jersey and is in good condition. She is also equipped with a Ford engine that has 32,100 miles. Reason for selling is college - need i say more!. 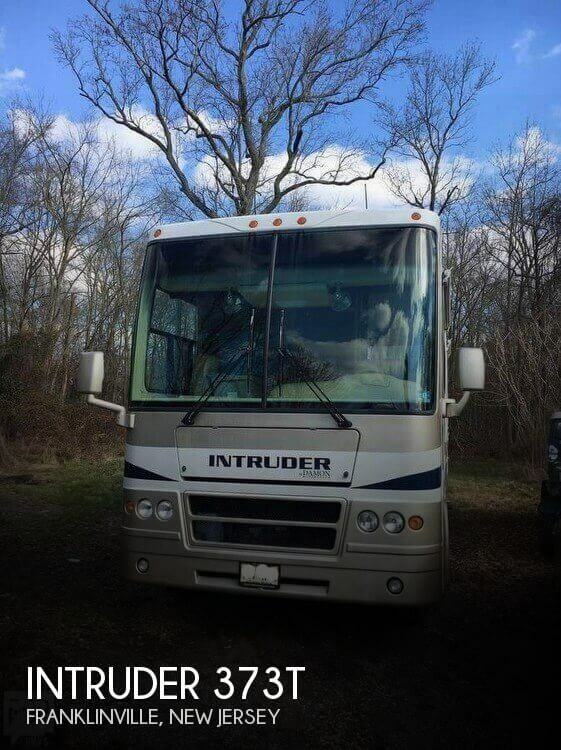 The owner of this RV reports that it is to be in overall "above average" condition. One issue noted by the seller- "There is a 3 inch crack in the far corner of the windshield, not seen while looking out. We figured it wasn't bad enough to replace." Some minor fading on a couple of the decals, but all-and-all in quite a nice shape for a 2007 model. ---KEY FEATURES--- New Mattress (High-end -- $2,000 value) Toy Hauler set up (Could be converted to another. 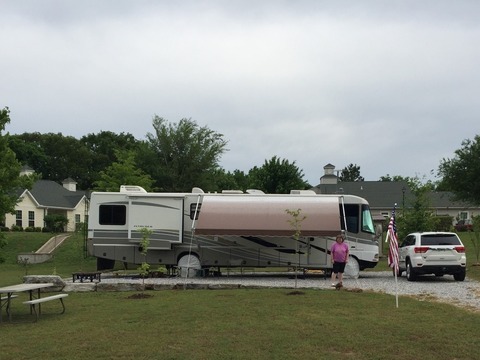 bedroom/ sleeping area) * Washer/Dryer Combo * Leveling Jacks * Dirt Devil Central Vacuum * 1 slide out and 2 awnings * Sleeps 4-5 comfortably * Cable Ready * Onan Marquis Gold 5.5 KW Generator * Smoke Detector * Backup Camera * Full Bathroom * Pantry * DVD/VCR and much more! Stock #167112 CLASS A Toy Hauler anyone???? This DAMON OUTLAW is the best of both worlds! ***BRING OFFERS! 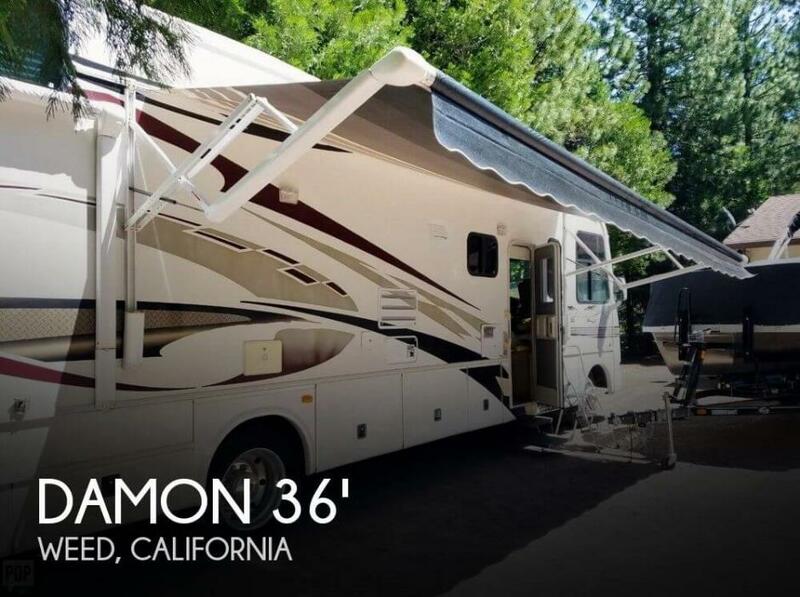 *** If you are in the market for a class a, look no further than this 2007 Damon 3611 Outlaw Toyhauler, just reduced to $47,500. This Class A is located in Weed, California and is in great condition. She is also equipped with a Ford engine that has 38,000 miles (as of January 18). Reason for selling is not enough time to use the rig. This Tuscany 4072 diesel pusher coach is ready to go, and needs nothing but for you to bring your clothes and groceries and hit the open road. It is well kept and clean. With less than 25000 miles driven, it is hardly broken in and has many years and miles ahead of it. Stock #168534 Excellent Tuscany 4072! Only 24,500 Miles On 360HP Cummins! 4 Slides! King Bed! 2 Heat Pumps! Many Options! 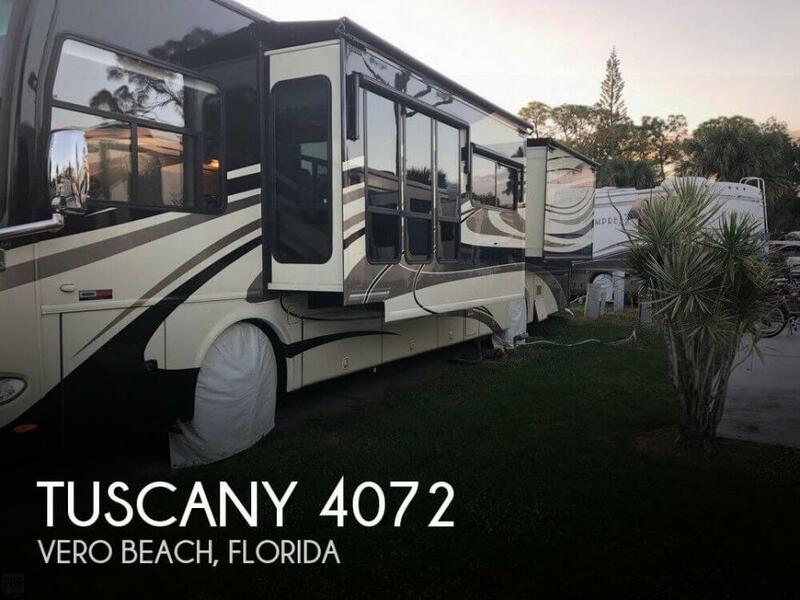 If you are in the market for a class a, look no further than this 2011 Tuscany 4072, just reduced to $112,000. This Class A is located in Vero Beach, Florida and is in great condition. She is also equipped with a Cummins engine that has 24,500 miles. Reason for selling is leaving the road. RV is in good condition for her age. Recommend replacing the tires (per age). The roof could use a couple of new caps and seam calk. The generator needs to be serviced. Please see the 200+ photos for a full look inside and out. Stock #148596 Challenger 327 with 2 slides, 10 cylinder engine with only 25,800 miles! If you are in the market for a class a, look no further than this 2003 Challenger 327F, just reduced to $22,900. This Class A is located in Sarasota, Florida and is in good condition. She is also equipped with a Ford engine that has 25,800 miles. Reason for selling is purchase a home. The exterior of the unit definitely shows it is a 2000 model which has been used. There are a couple of dings on the left rear that have been patched. The interior is in really good shape for the age of the vehicle. Stock #162010 2000 Damon Ultrasport with diesel 24 valve Cummins, Very Cozy Interior If you are in the market for a class a, look no further than this 2000 Ultrasport 38, priced right at $43,900. 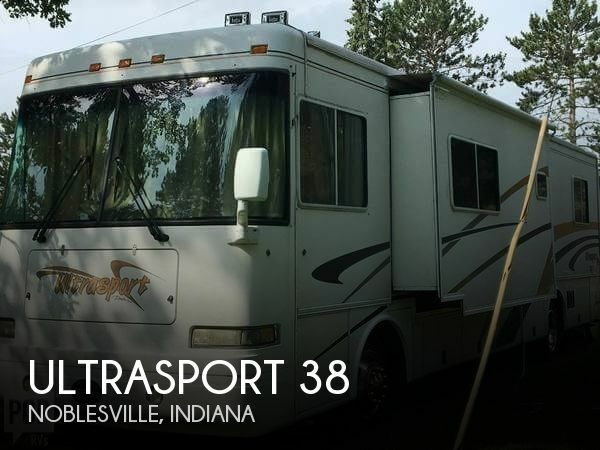 This Class A is located in Noblesville, Indiana and is in good condition. She is also equipped with a Cummins engine that has 84,000 miles. Reason for selling is wants to upgrade. The owner put newer awning tarp on, needs a new microwave, The owner did many upgrades and put new tires on 7 months ago with 3,000 miles on them now. Needs new wiper motor. Still works but is slow. Newer floors installed, newer flat screen, globe satellite included, car dolly, if needed, is newer, serviced 7 months ago. 350 hrs on Onan generator. 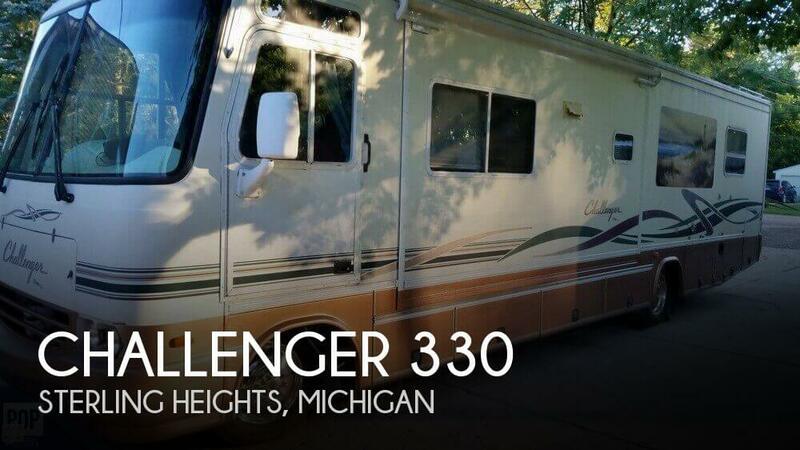 Stock #168041 Well cared for Challenger coach with many upgrades including back splash & new floors has new tires and car dolly plus satellite & new flat screen TV If you are in the market for a class a, look no further than this 1999 Challenger M-330, just reduced to $16,500. 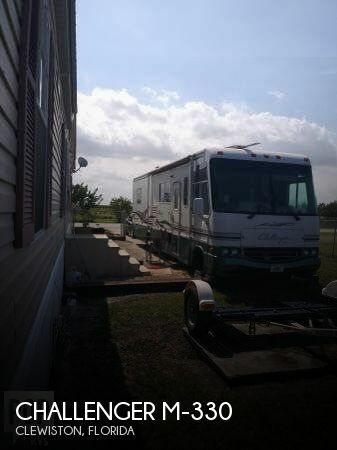 This Class A is located in Clewiston, Florida and is in great condition. She is also equipped with a Chevrolet engine that has 34,000 miles. Reason for selling is dont use now that we are in florida.